Tatarski has found the frequency spectra for the amplitude, phase, and phase-difference fluctuations of an infinite plane wave propagating through turbulence. 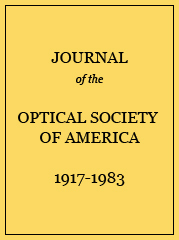 Many practical optical beams, used in atmospheric studies, closely resemble point sources, for which the spherical-wave theory is more applicable. The same spectra, calculated for spherical waves, reveal contributions at higher frequencies for amplitude scintillations, nearly identical phase results, and a phase-difference spectrum with no nulls, in contrast with the plane-wave results. Comparison with recent data is shown. a Symbols used in the table: λ=wavelength, k=2π/λ; v=wind speed perpendicular to k; ρ=separation in plane perpendicular to k; L =path length; Cn2=strength of refractive turbulence; f=frequency, Ω=f/f0, f0=v/(2πλL)−1/2; χ=log amplitude; S=phase; l0 =inner scale, L0=outer scale.